Did you ever wonder why your Ranking in Google is bad while your engineers telling you that all systems run stable with light speed performance ? And did you ever wonder why your page views in total differ so much from your ad impressions ? Yes ? Than you might be a victim of being „overADded“. Really. haha. You might have too many rubbish AD-Delivery instances serving content to your page. Or by far too many redirects or your marketer doesn’t care about the quality of ad-networks they are working with. What are the symptoms of being overADded? To diagnose overADism is pretty simple. To exclude real bad issues (like your DevOps doing nothing but playing table soccer) you should baseline your staffs work. Page statistics with the „Base-ad-script“ blocked. 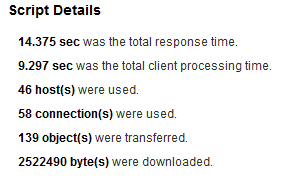 So – this is a pretty common statistic (using various host names for image or script servers). In this specific case I simply blocked one single content: The script of the marketeer to handle ads placed on pages ad spaces. Fair enough to say that the page is a bit heavy weight but – honestly – the page is build for some business which needs nice and fancy graphics -one can connive on that fatness fact. There is a freaking high amount of hosts apparently initiated by the base-ad-script coming from redirects to Ad-networks redirecting to Ad-bidders redirecting to Ad-geolocators redirecting to yieldmanagers redirecting to (extend by your own demand) ….the Ad itself. And all this – spiced with rocket science – in real time…..
Ok ok. Not in real time…there is a gap of 12 Seconds….12 Seconds is an aeon in the web performance perspective. One might argue: This was just one measure from your local perspective! And I have to admit, that the argument is pretty valid. But lets check the permanent difference of the page load time serverd to average bandwithes in the main business country of this page. Will it look different from this momentary snapshot from above or will it look worse ? The measurements were taken from all over one Country and various real Desktop machines (or Laptops) over the time frame of one week. The yellow line represents the measurements excluding the base-ad-script. The blue line the overADded page. And – what a shame the average is telling ~12 Seconds delay is the „common“ time lost on ads. But I bet there are some guys around here noticing spikes and with these they notice that the difference in load time spikes partly over hours. 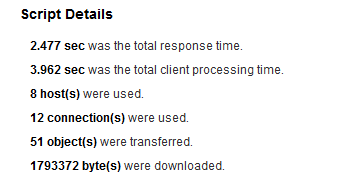 And they notice that the load time within these hours is way over 12 Seconds. (Luckily sometimes it is way faster (so lets hope that at those times the search engine bots are active)). Unfortunately the spikes appear during your main business hours – when most user hitting your page. You loose business when most traffic is running on your page. Maybe even users get bored serving your page (and you know you are not the only one fighting in this area of interest). But you don’t care – it ran always this way. Your staff doesn’t care („Not my business“). You do not respond to emails. You are too rich – are you ? If you don’t care, do your stakeholders might want to know what money they loose ? Don’t be arrogant – take care of your business. It is your staff which is blamed when a page is loading slow. It is your money thrown out of the window for „Make us faster Projects“. Monitor your business – even more important when your business is based on other peoples power to serve. Where the hack are the Busyness-Opps?